We take vehicle wraps seriously. We are no wrap mill. We have talented designers, market research skills to align design with your core demographics, and an Epson high resolution printer. Real value for your investment. One of a Kind. You are unique. Make your ride one of a kind, too. 100's of Colors. 1000's of Looks. Unique. Matte, Metallics, Brushed Metals Chrome, Neon, Color Shift Camo, Wood Grain, Combos Custom Craft Your Today. 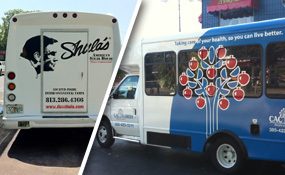 Van wraps have plenty of surface area to place stunning graphics. As with box truck wraps, resist the temptation for clutter. Big images, vibrant color. 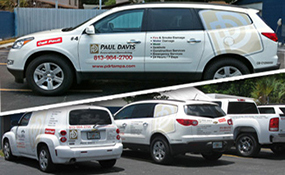 Car wraps take extra design skill, as the continuous image area is smaller and often broken up. Limit text for effectiveness. A professional marketing executive told me it was the best conceived and executed idea she had seen in 8 years in the business! - Dr. M. Blum, LM Medical I love it! I’m very happy I didn’t go with the other guys. I love the reflective! I’ll definitely bring the rest of my vehicles to you guys in the future! - J. Rose, Caffeine Energy Drink Co.
RV Wraps have huge surface areas, bigger than outdoor billboards. 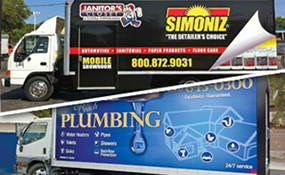 Well executed RV Wrap’s generate big interest and bigger sales. 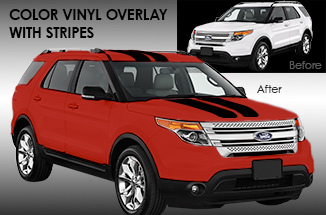 SUV Wraps are a perfect advertising medium. 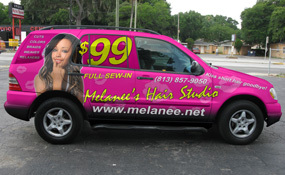 Larger than passenger cars, SUV wraps give more surface area to sell your message. 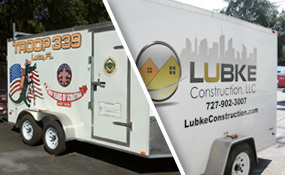 Trailer wraps can be twice as big as car wraps, but half the price. 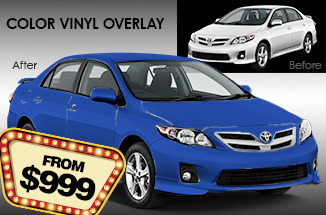 Flat surfaces allow wrap shops to use more inexpensive vinyls. Vehicle wraps parked at busy intersections are excellent traffic generators. The owner of GGS had a wireless chain with one mediocre location. A wrapped van on Orange Blossom Trail took sales up over 30%. 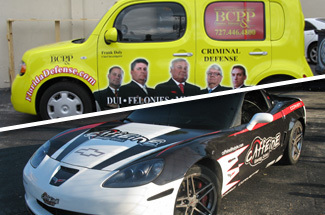 Vehicle wraps can drive big traffic and big sales, if executed well. Transport graphics and wraps are effective due to the long hours and huge number of views they receive, up to 12 million per year. 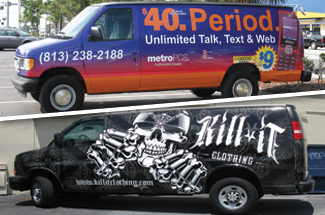 Box truck wraps have a huge amount of space for a large, vibrant picture, appealing colors, and your message. Resist cluttering the sides. From $1800. When you demand consistent, stunning prints, color matching, and a well coordinated installation process for your fleet wrap, you’ve found the right place.